Teddington has an excellent social atmosphere, both on and off the court. 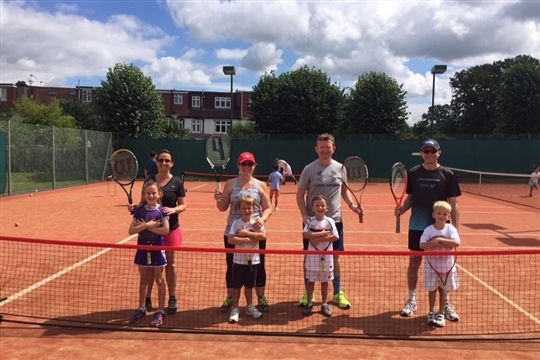 Social tennis is an integral part of the club, with sessions running from 6:30-10pm on Tuesdays and Thursdays, and 2-5pm on Saturdays and Sundays. The standard is strong, with over 80% of players at midweek social tennis in the teams. A coach is present to organise matches on Tuesdays, Thursdays and Saturdays. The Curry Cup is an ever popular event. Three times a year, a team of Over 30s takes on a team of Under 30s, in front of a raucous crowd. Would you believe the Over 30s have won 6 of the last 7 events? There are several other social events thoughout the year, including quiz nights, barbeques and the immensely popular Finals Weekend party on the first Saturday of September. The whole Finals Weekend is a massive celebratory occasion where hundreds come down to watch some excellent tennis from all sectors of the club. Come and enjoy a drink in the club bar after you've played (and maybe bemoan that botched forehand that cost the Curry Cup!). Now you're here, why not like us on Facebook and follow us on Twitter by clicking the symbols at the bottom of the page?